These vegan curried butternut squash fritters are so easy to make with just a few simple ingredients! You can have these gluten-free and vegan fritters on the table in under 30 minutes! After making my jalapeño corn fritters awhile back, I’ve become obsessed with the idea of fritters. They’re just so easy to make and are great for a side dish or appetizer. So when I found myself with an abundance of butternut squash after making this pesto pasta with butternut squash recipe, fritters immediately came to mind! I didn’t want these to be just any old butternut squash fritters though. I decided to spice them up a little with curry powder for a unique flavor. 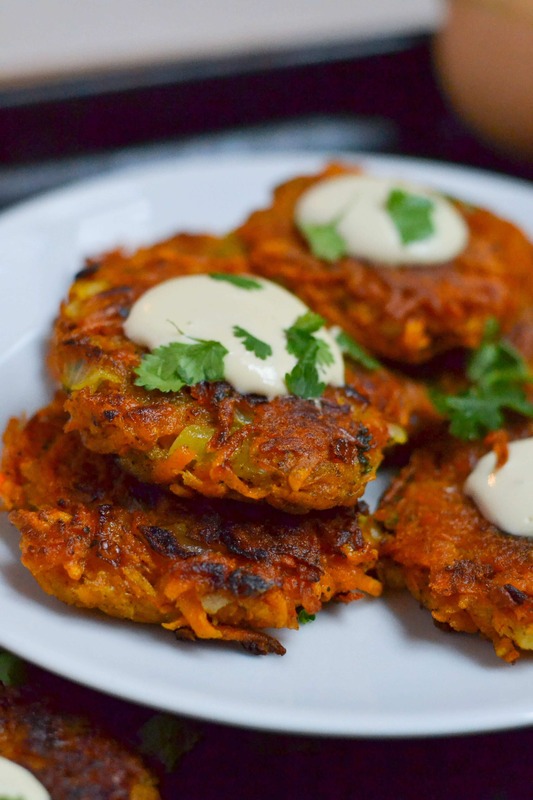 I’ve made a curried butternut squash soup before, so I figured adding curry powder to these fritters would be an excellent flavor combo – and I was right! They turned out delicious! Normally when you make fritters, you make a batter including eggs and flour. However, since ours are gluten-free and vegan, we use a gluten-free flour blend (Bob’s Red Mill 1 to 1 baking flour is one of my favorites when I’m not making my own blend) and a flax egg, which is a combination of ground flax meal and water, to act as an egg substitute. Of course, if you don’t need these to be gluten-free or vegan, feel free to use all-purpose flour and regular chicken eggs in this recipe. You’ll love them either way! These vegan curried butternut squash fritters have great flavor from the combination of curry powder and cilantro and are so easy to make. They mixture itself is ready in no time, and then it takes just a few batches of pan frying the fritters and they’re ready! I topped mine simply with coconut yogurt and more chopped cilantro. But they would taste great plain, too! These vegan curried butternut squash fritters are topped with creamy coconut yogurt and cilantro. Gluten-free, dairy-free and vegan. In a small bowl, mix together the flax meal and water. Let sit for 5-10 minutes, until it thickens and reaches a gel-like consistency. In a large bowl, mix together shredded butternut squash, onion, cilantro, curry powder, salt, black pepper, gtuten-free flour blend, and flax egg mixture. Preheat a large skillet over medium high heat. Add two tablespoons of oil to the skillet. Form the butternut squash mixtures into 1/4 cup balls. Add to the skillet in batches of 4 and flatted with a spatula. Cook on one side for 3-4 minutes, flip and cook an additional 2-3 minutes, until the fritter is lightly browned. Top with coconut yogurt and chopped cilantro to serve. Yum! Curry and butternut squash sound like a fabulous combo! Thanks Carolyn! They are so yummy!